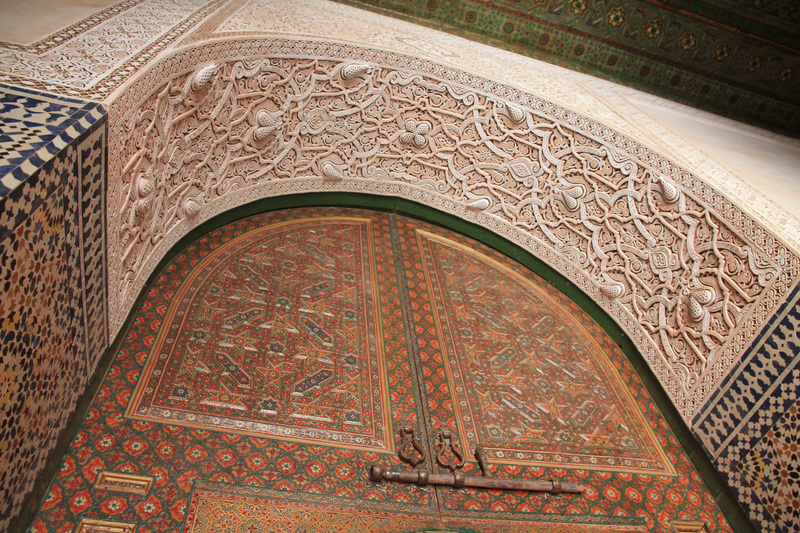 After an enchanting experience in fairytale Marrakech, we headed east on our third day in Morocco. This trip would take us far away from the city’s busy medina. We were picked up in the morning by Idir, our guide, and Mohammed, our driver, with their 10-year-old (but trustworthy and strong as a dinosaur, according to Mohammed) Toyota 4X4 Land Cruiser. 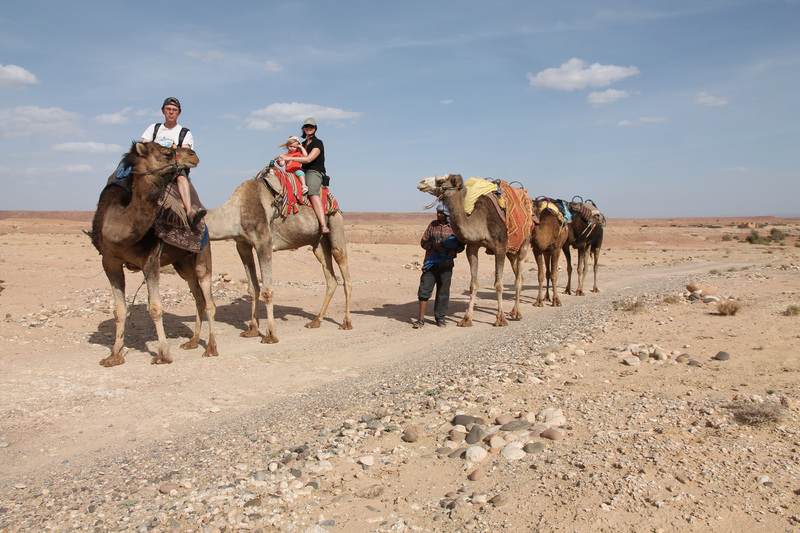 We had booked this daytrip through www.saharadesertkingdom.com, a small tour company we got to know through Twitter. 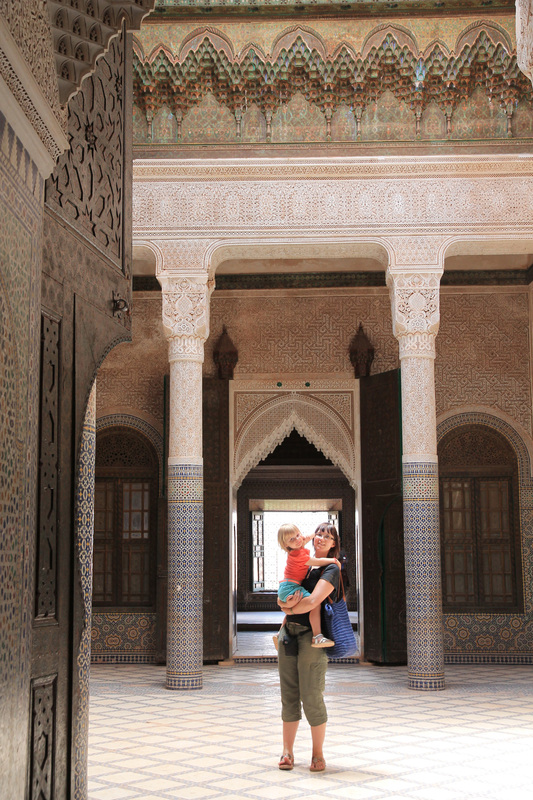 In a way, our shared interest in traveling brought us together, and the first acquaintance with Sandra (via mail) and Idir (in Morocco) was more like meeting friends than saying hello to your average tour guide. 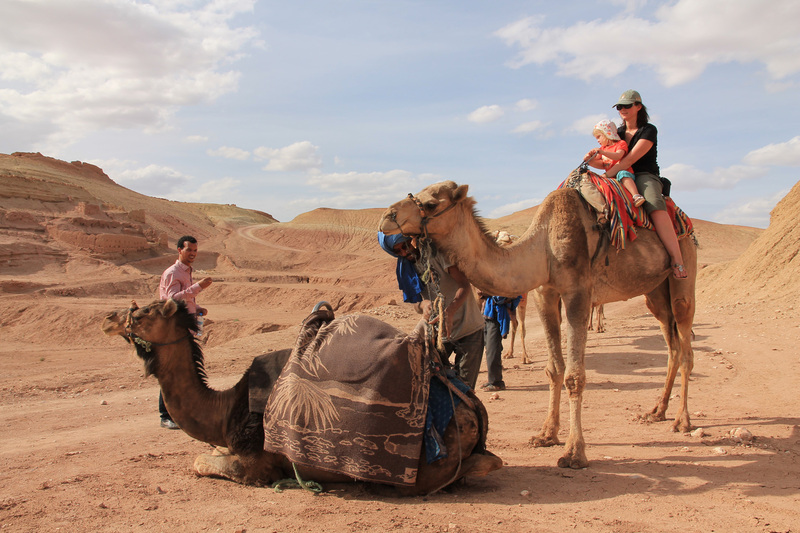 Traveling with them was a warm-hearted, top-class experience with no downsides whatsoever. 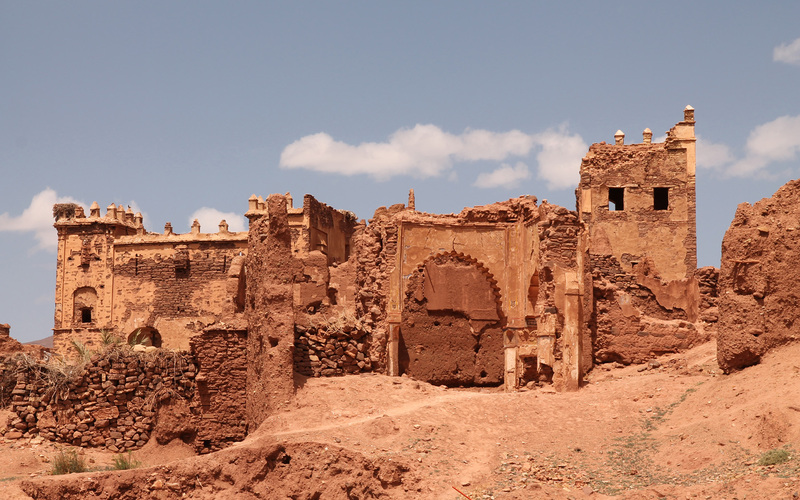 Idir and Mohammed would prove to be the perfect companions on this day: as they are Berber themselves, they were able to provide us with first-hand information on the area, its inhabitants and their culture. But they were also super friendly and pleasant people to be around. Mohammed would become Febe’s favorite and vice versa. And so we set off to explore the east. 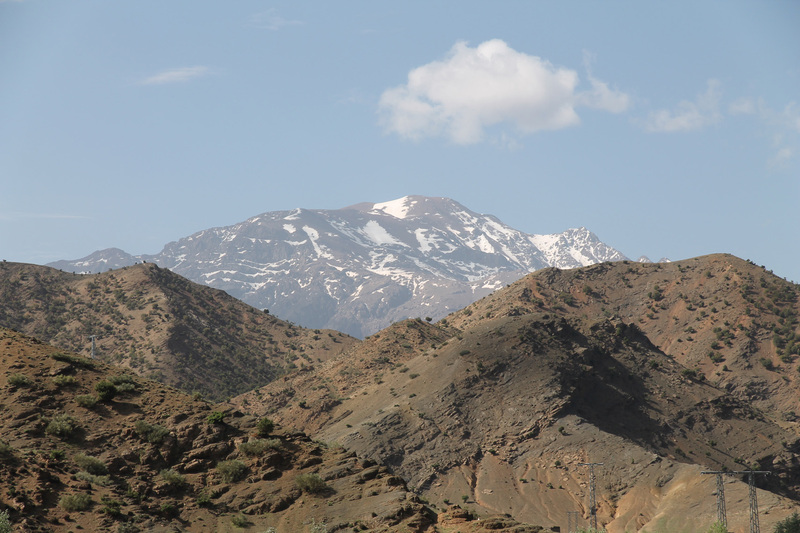 We headed to the high atlas, with snowy peaks up to more than 4000m (Jbel Toubkal, the highest mountain in North Africa). 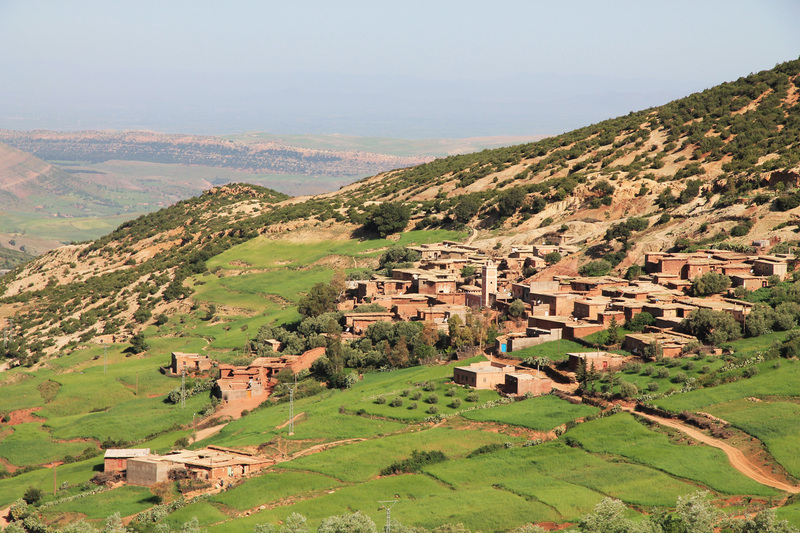 We would first drive up to the Tizi n’Tichka Pass (2260m), and go down again from there to take the road to the Kasbahs of Telouet and Tamadakht, and the famous Ksar of Ait-Ben-Haddou. 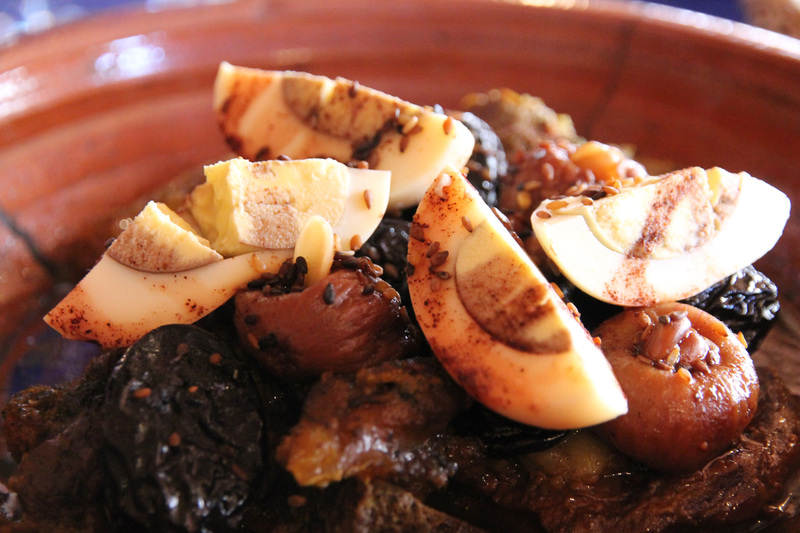 The area east of Marrakech is very rural and consists of fields of simply all kinds of crops, including olives, oranges and pomegranates. 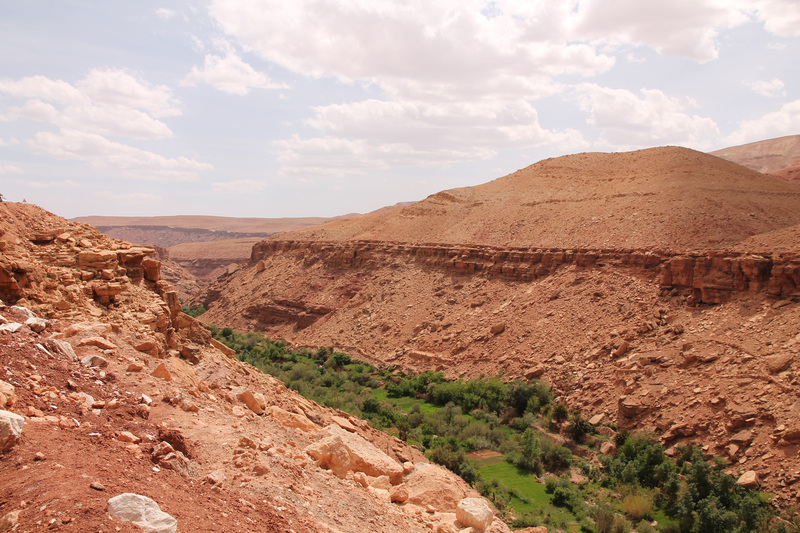 The vegetation was still quite green and some rivers or canals still contained water, although Idir told us that rainfall in the area of the high atlas has become very scarce the last years, as a result of global climate change. 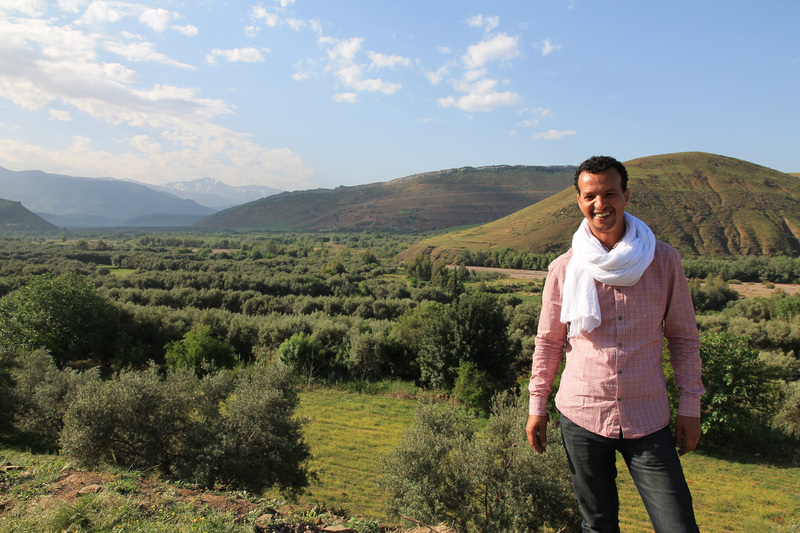 Our guide Idir in front of the green hills east of Marrakech. Soon, the area became more hilly. 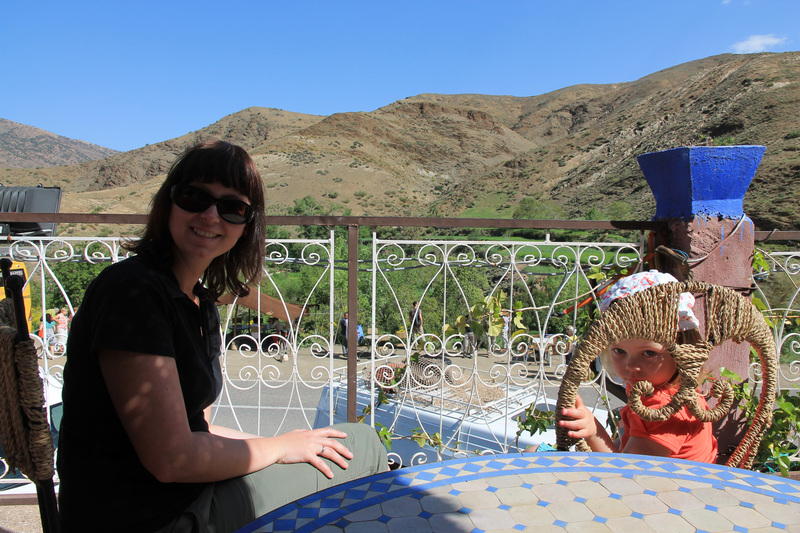 Yesterday, we had discovered that you could see the peaks of the High Atlas even from the Medina of Marrakech. But as we neared the mountain range, their presence became even more prominent. The slopes became increasingly higher and soon we were driving on winding roads between hillside towns, gazing in amazement at the wonderful views. It was like we were driving in the alps! Annick, Idir and our driver Mohammed in front of a snowy peak. 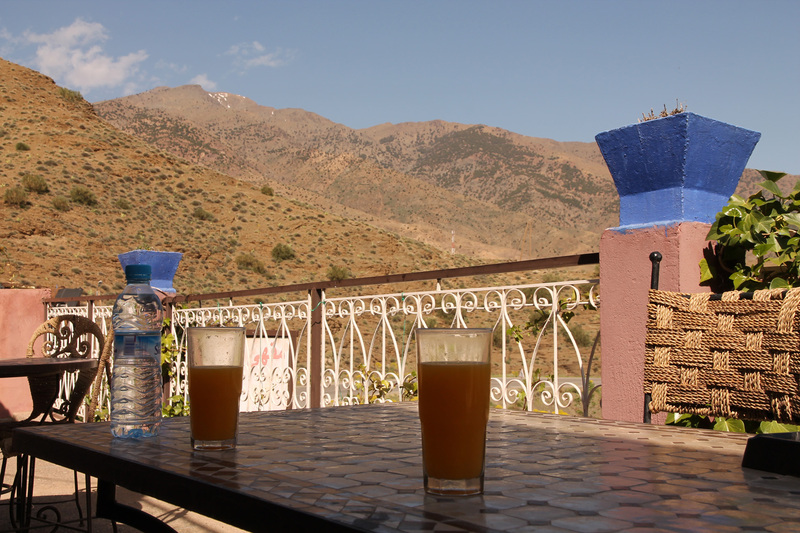 Enjoying a freshly pressed orange juice on our way to the Tizi n’Tichka pass. Febe and Idir and a hillside town high up in the mountains. Winding roads close to the pass. 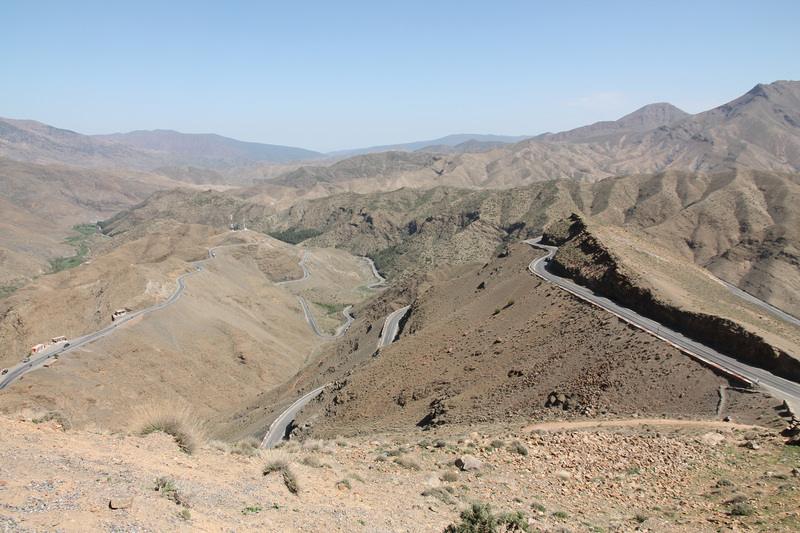 After passing the Tizi n’Tichka Pass, we took a smaller road to the east, in the direction of Telouet. 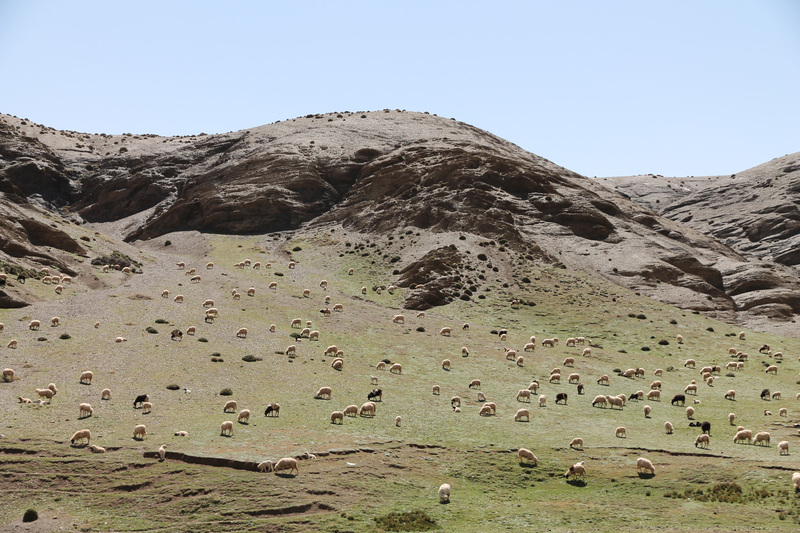 It was very quiet here, as we drove alongside a green valley and between the sheep- end goat-grazed slopes of red-soil hills. 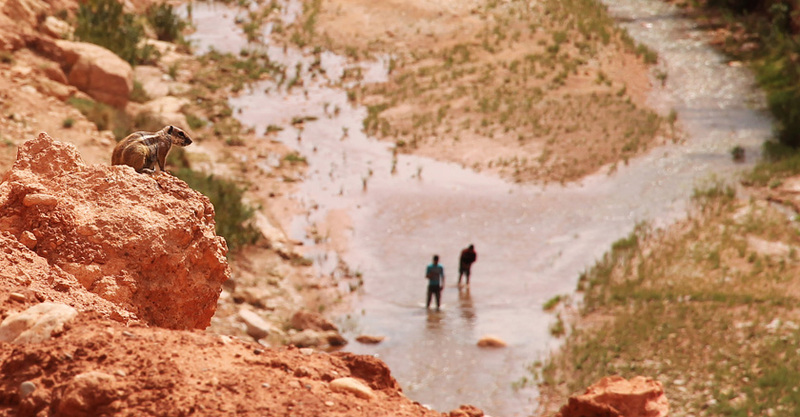 Before we finally reached Telouet, we passed quite a few red-brick towns where mules seemed to be the only (or at least most commonly used) means of transport. 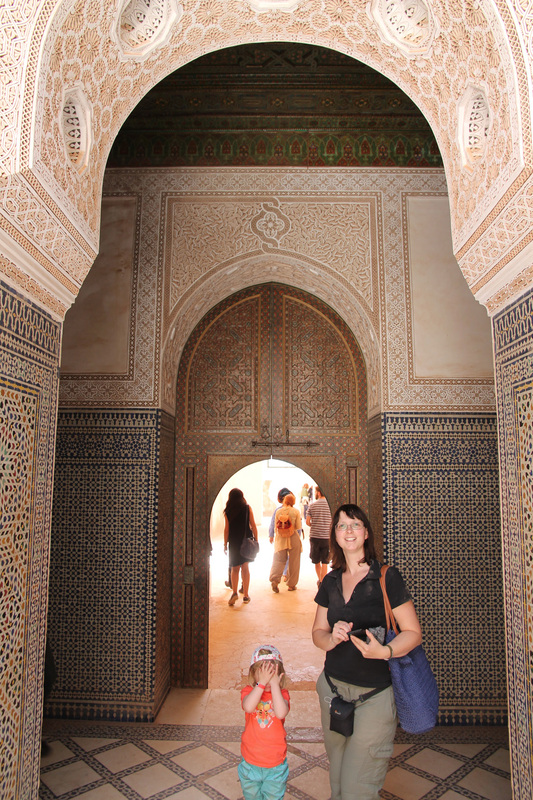 The kasbah at Telouet was quite the surprise to us. Maybe we had focused too much on Ait-Ben-Haddou as the main attraction of the day (and the dromedary ride, which definitely was Febe’s main attraction of that day), but we had forgotten to check on detailed information about Telouet before we left. From the outside, it looked like any other ruin from the area, built from red mud. 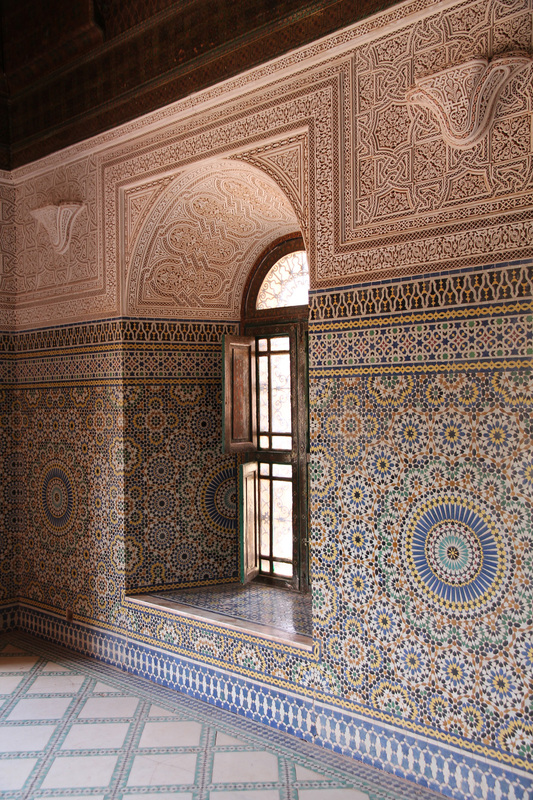 The inside, however, was remarkably intact, featuring some intricately decorated rooms. 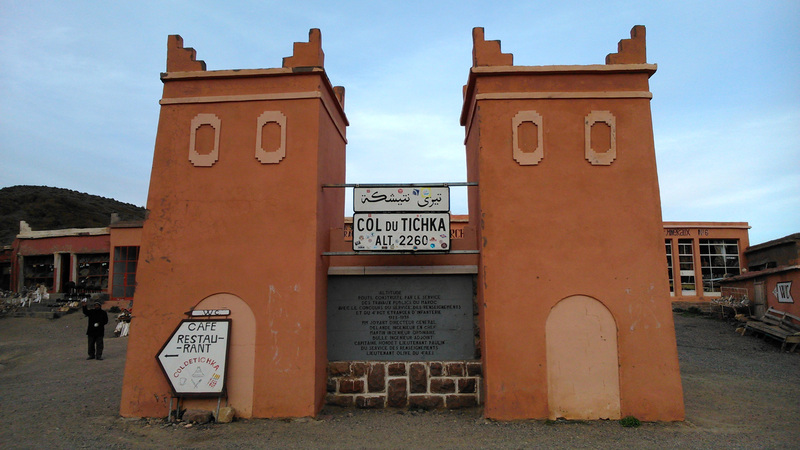 Entrance fees are used to finance the restoration of this little gem, built by slaves for the Glaoui leader in the 19th and 20th century. We were very much impressed by the degree of craftmanship that was used to embellish this fortified house. 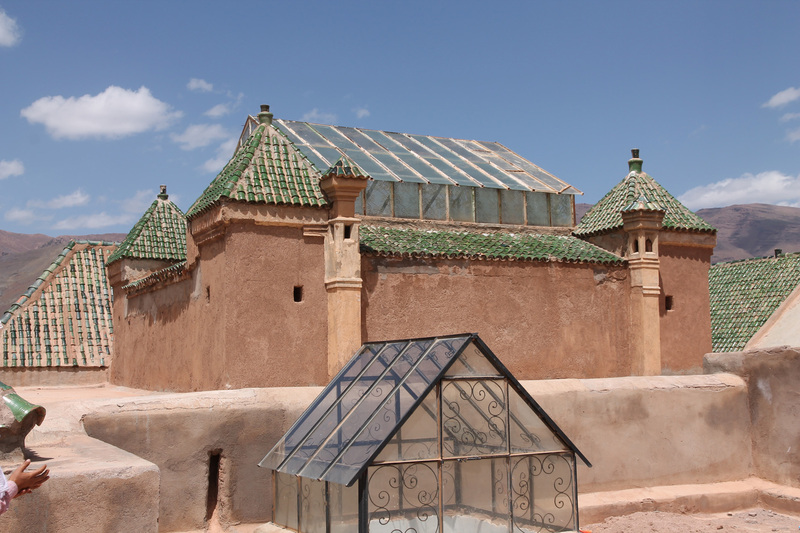 Another highlight is the roof with its green glazed ceramic tiles and nice views of the town and its surroundings. The degree of detail is incredible here! Tiled walls with the finest of decorations. Mommy and Febe at one of the beautiful doors. The roof: notice the green glazed tiles. 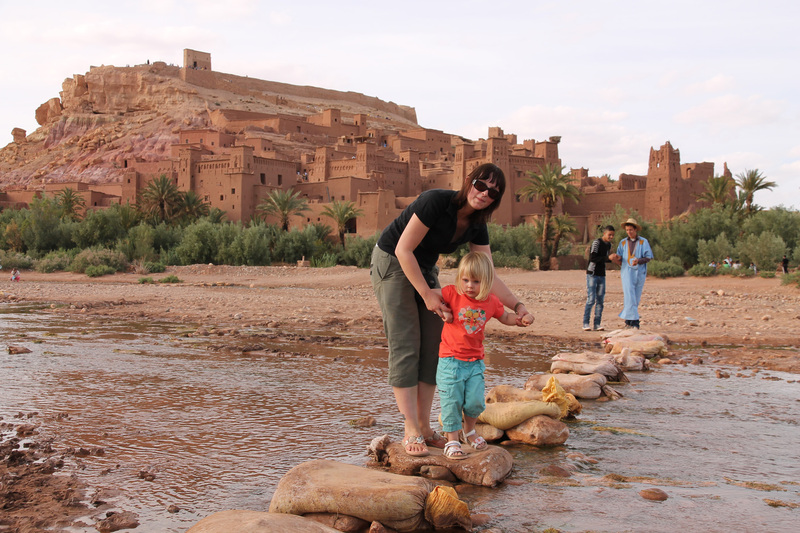 After a very tasty lunch of diverse appetisers and a lamb, figs and walnut tajine, we headed to Ait-Ben-Haddou. Along the way, we spotted some interesting wildlife: storks nesting on rooftops, bee-eaters and swallows enjoying lunch in the air and a long-awaited encounter with a Barbary Ground Squirrel. The valley became a gorge with steep slopes on both sides. 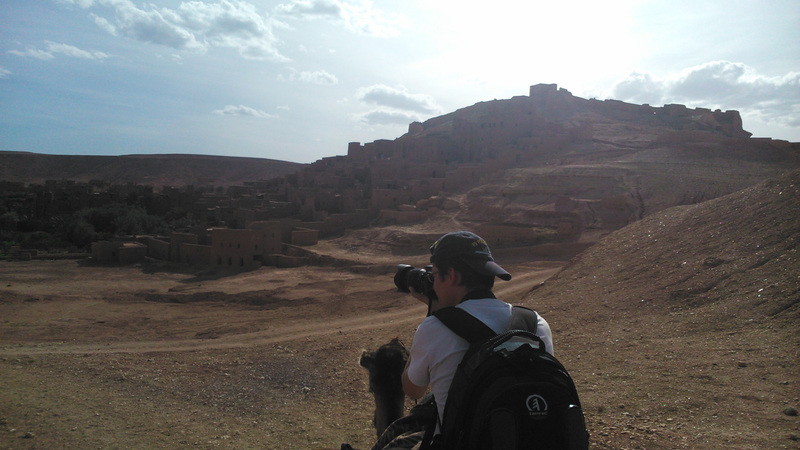 We made a quick stop at the Tamadakht kasbah, where part of the movie “Kingdom of Heaven” was filmed. The gorge close to Telouet. 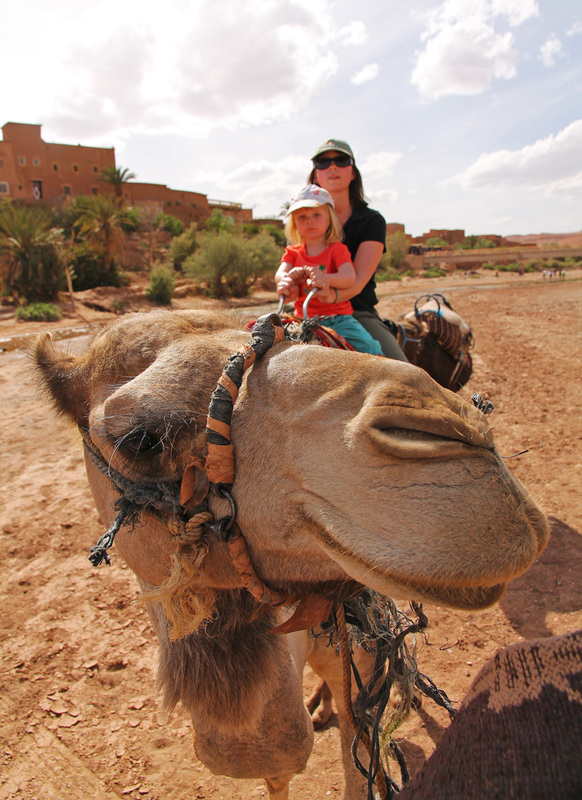 Ready to ride the dromedary! Arrival of the dromedary girls. Our shaky trip ended at a spot where quite some battle scenes from “Gladiator” were filmed. Ait-Ben-Haddou is most famous for its use as a film location, including movies such as Jesus of Nazareth (1977), The Jewel of the Nile (1985), The Mummy (1999), Gladiator (2000), Alexander (2004) and Kingdom of Heaven (2005). Parts of the ksar have been seriously renovated for this purpose. 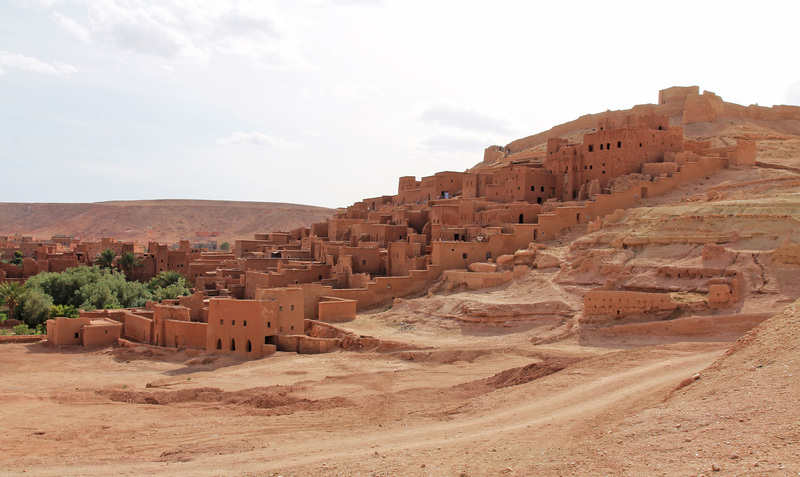 The ksar (or fortified city) itself is an ensemble of narrow roads and steep stairs, leading to the summit from where you have quite a stunning view over the city itself and its surroundings. 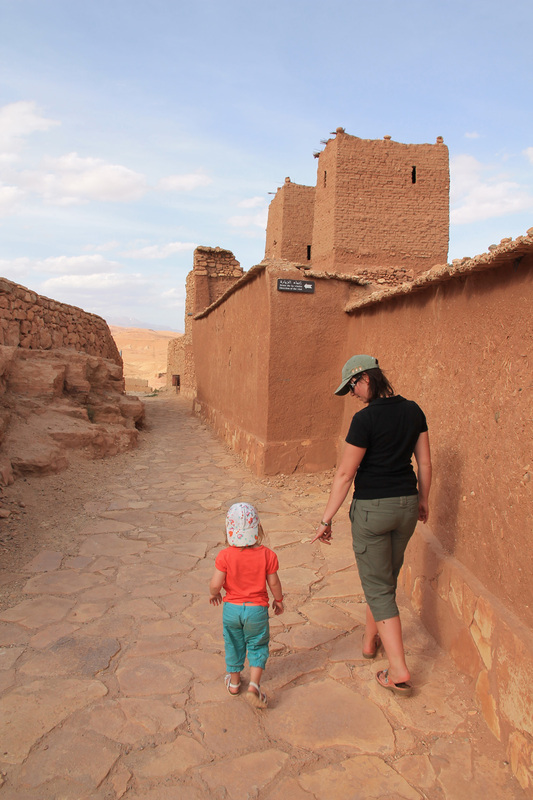 Walking the narrow streets of Ait-Ben-Haddou. 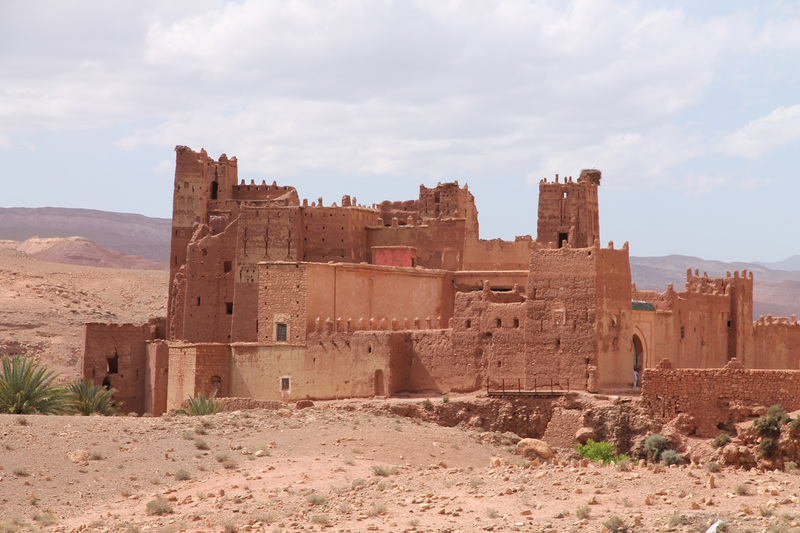 The ksar at Ait-Ben-Haddou is a typical and stunning example of pre-Saharan, South-Moroccan architecture. 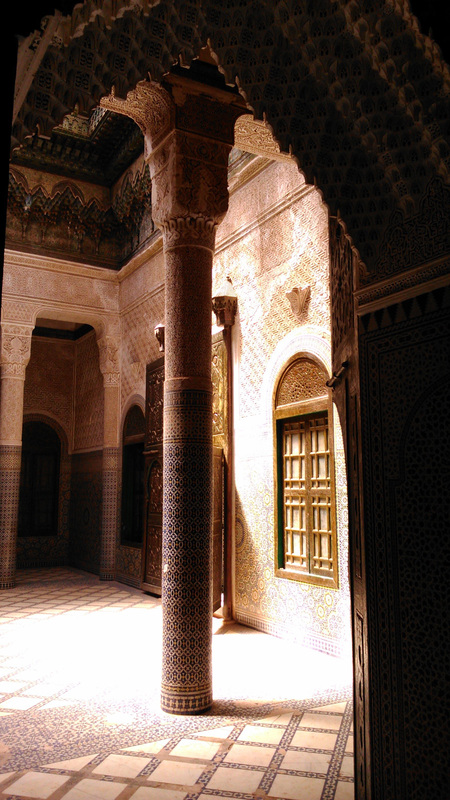 Just like the kasbah, the family unit for the wealthy class, the ksar is a type of traditional habitat. It’s a collective grouping of earthen buildings surrounded by high defensive walls and reinforced with angle towers and zigzag-shaped gates, common in all countries of the Great Maghreb. 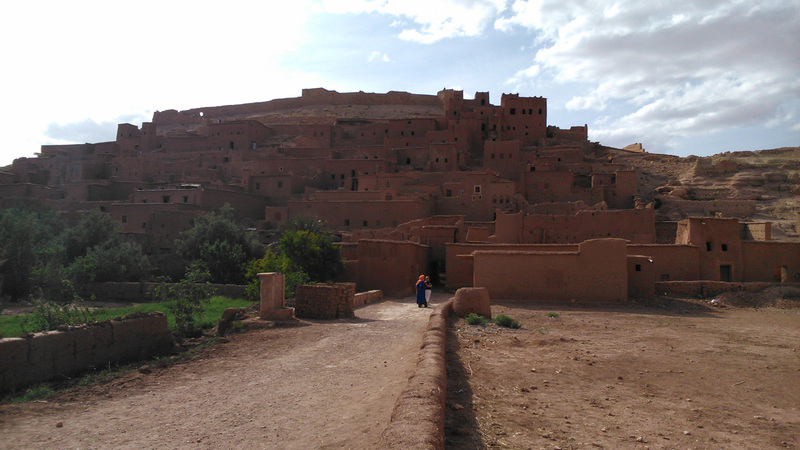 The structures inside a ksar are either houses, collective buildings or community areas. 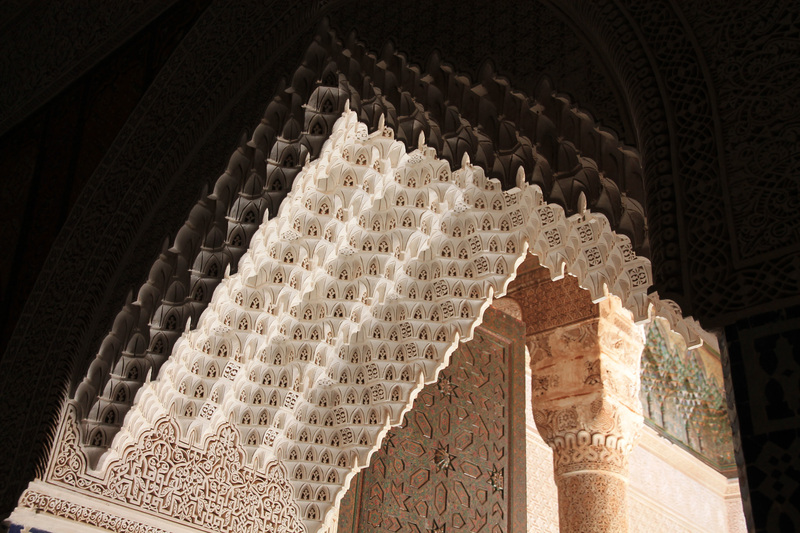 They were constructed using a range of pre-Saharan construction techniques. 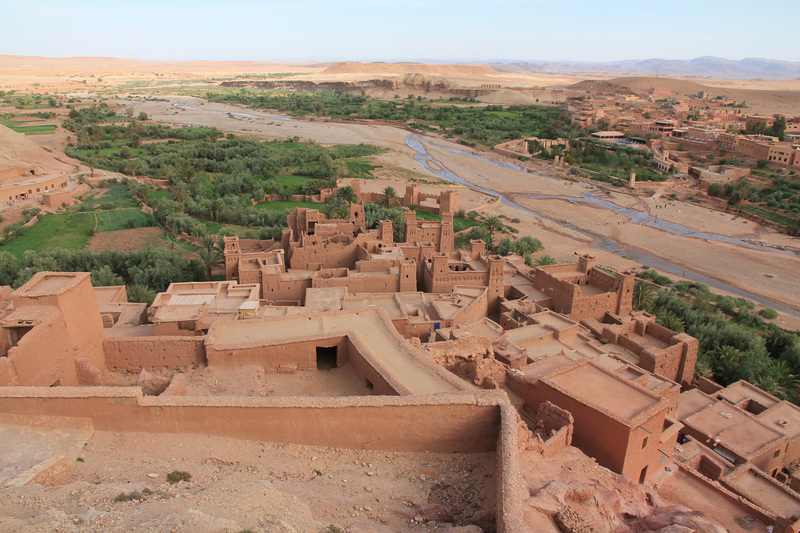 The ksar of Ait-Ben Haddou is built against a hill for protection issues and is located along a former caravan route, between the High Atlas mountains and the Sahara desert.